Many writers and painters and creative people of all types say they don’t want their thinking to outdo their doing. Minimal self-consciousness is their goal, and they don’t want to be distracted by matters outside the work. Let the particulars of style and technique take care of themselves, they mean to focus on the subject. Me too, but I can’t help myself and periodically have to ask what the hell I’m doing. Reading John Ruskin’s Modern Painters reminds me how far off I can be. He gets in a grumbling match with metaphysicians over where the quality of a thing resides, in the observer or in the thing itself, and he turns to poets who engage in pathetic fallacy and assign qualities to things. This power is always there, in the thing, whether we are there to experience it or not, and would remain there though there were not left a man on the face of the earth. Precisely in the same way gunpowder has a power of exploding. It will not explode if you put no match to it. But it has always the power of so exploding, and is therefore called an explosive compound, which it very positively and assuredly is, whatever philosophy may say to the contrary. To glide in shades, and wander with the dead? Outfly the nimble sail, and leave the lagging wind? That “oft’s been thought” insinuates no new explosiveness to discover in things, and his “so well expressed” implies the artist’s powers come before the power of the subject. Contemporary artists have more in common with Pope than Ruskin. Ruskin’s idea that the artist is a medium to nature’s power has lost out to artifice. Contemporary creativity allows the artist so much more license. We’re free to declare anything gunpowder and celebrated for doing so. We never hesitate to create ill-made matches. Not appreciating art is often the perceiver’s problem. The specialized and rarified realm of Art sits on a mountain of self-definition. I think Ruskin might say we’ve changed the landscape to place ourselves above the true business of creation. He might say we want to regard ourselves as above the power of things. 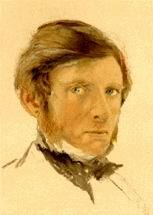 Ignoring Ruskin makes life easier for artists, which makes me think we shouldn’t ignore him. I suspect any aesthetic relying too exclusively on fabrication. Yet, my work is full of the most pathetic sort of projection, and I paint mostly abstracts that have no true Ruskinian analogues in the natural world. They are synthetic gunpowder, if that, and I’m asking viewers to be acetylene torches, not just matches. Maybe I should ask how synthetic my synthetic imagery is. Maybe I should ask if what someone reads or sees has some place in this world as well. I don’t want to be base. I’d like to unleash the power in things. I’d like to find gunpowder ready for matches. I read in the New York Times that, by twenty-one, the average American has spent three times as many hours playing virtual games as reading. I’ve been sharing this factoid for the last couple of weeks. Some people ask about the source of the figure, how it might be broken down by gender, age, and class, and what definitions determine its key terms. Others see it as evidence of the cultural whirlpool threatening to flush us all. To me, however, the most interesting response comes from people unfazed by the news. “That seems about right,” they say, waving off the figure’s incendiary intent. Being an English teacher, I’m tempted to arm myself against a sea of amusements (again), but I’m fighting to remain calm too. I’m not a young American and don’t know virtual games well enough to judge their merit. And I can’t look into the future to assess how relevant reading will be. Though I teach literature, I’m ready to accept it’s had a good run and other skills may be more relevant. Let’s face it, reading has many worthy entertainment rivals. Sometimes I’d rather watch TV, stream a movie, listen to music, or wander around online than pick up a novel. I don’t see how a book can compete with a video game. And I’m getting used to the idea that reading for pleasure sets me apart. I am perversely cool by being thoroughly un-cool and may be even happier as my reading habits become more outmoded, arcane, and eccentric. If the statistic is valid, my talents interpreting writing will soon be rare. Demand will drop, but I’ll splash around in a smaller supply pool. Nothing beats the sanctimonious glee of being a correct minority. I’m joking, a little. I’m supposed to care, not just because it’s my livelihood but because literature is high culture and virtual games are not. Still, the statistic is a strange relief, a welcome salve to my teacherly despair. The talented and experienced readers in my classes are capable students, but others seem to be slipping. I’ve been wondering why, year after year, readers become slower and more careless. Twenty page assignments are now “long” and books rated at a fifth grade level are “hard.” I’m happy to know the problem might not be me or my colleagues. In any case mourning seems wasted energy. I need energy and resourcefulness to educate inexperienced and uninterested readers, and I can’t feel sorry for myself. The greater challenge follows. Widespread literacy arose from deciding reading is essential, a gateway to recovering profound thoughts and learning. We’re in the opposite situation now. No one needs to be an expert gamer to recover truth. Games are fun, but while skill might bring social cachet and train minds in useful ways, they have, as yet, fewer practical applications. I feel like a successful English teacher if I can convince students the work of reading can lead to pleasure. I’ll let others pioneer the reverse process, how to turn the pleasure of playing games into useful work. Writing poetry requires reading it—otherwise, how will you challenge yourself to reach something original and how will you know if you’ve accomplished it? Yet, I understand why reading poetry can be intimidating. Some poetry seems so well written that it’s well out of reach for me. Some poets shame me with endlessly perfect decisions about diction, syntax, imagery, and metaphor. Their impossible standards wouldn’t bother me so much if I could call them stupid, but when I meet a poet who’s doing what I’m doing—only much better—it’s disconcerting. The rainbow in it scattering grains of spray. Some poets reject Nemerov’s formality—his meter and rhyme, his “in which” and “wherefore,” his inversions and semi-colons. As in much of his work, however, these elements fit and extend his observations, demonstrating his absolute and deliberate authority. The rigidity of this poem communicates the stiffness of the sprinkler as line breaks serve to move your eye back and forth, starting where they ought to end and ending where they start again. And the poem isn’t just technically proficient either. In something as simple—but mesmerizing—as the sprinkler, Nemerov finds familiarity, resonance, and surprise. He describes the sprinkler vividly enough, but he also leads us to humility, pride, forgiveness, and rebirth. He finishes with a grace note, the metaphor of water droplets as “grains of spray,” wet and dry all at once, both extremes embodied in a simultaneously novel and recognizable image. Though “resourceful” is a word many contemporary poets might run from, Nemerov embraces it. If I could write one poem like the one above, I might be satisfied, but Nemerov holds to his standard. Each poem is good for a few flashes of discovery: bones as “cantilevered,” wet grass beneath a removed storm window “like seaweed on the tide” or “blades of wheat,” and lobsters as “gigantic spiders that spin not.” He revitalizes every ordinary. The clouds are “bellied,” and the heart is a web where, as this blog notes, every vibration is a “signal to attend.” Nemerov seems undaunted by his ambition to awe. His faith seems unshakable—he will eventually find exactly the right answer. When I collect my poetry and read it together, I find the same words cropping up everywhere, one soupy serious tone, and habits of composition that seem to me much too obvious. I see the places where I needed something special and satisfied for something serviceable. 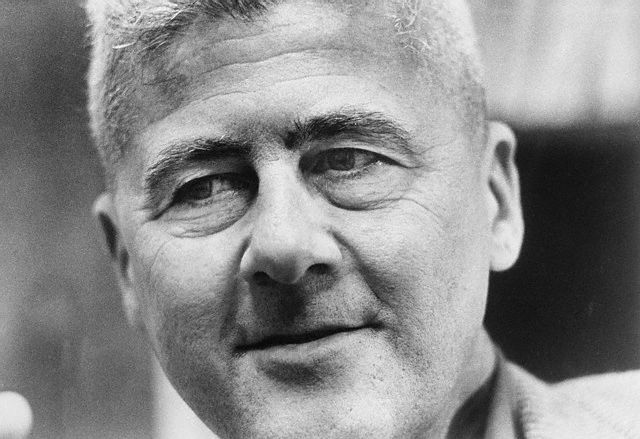 Howard Nemerov’s poem “Poetic” centers on an old joke—a housewife doing her wash decides to add the clothes she’s wearing, and, when a leaky pipe starts dripping on her head, she puts on her son’s football helmet. When the meter reader arrives and sees her there, he says, “Lady, I sure hope your team wins.” The story is a parable of Nemerov’s poetics and a window into his approach. “A story many times told in many ways,” he says, is “a set of random accidents redeemed/by one more accident, as though chaos / were the order that was there before creation came.” Reading his poems, you sense he played around and played around, encountering accident after accident, looking for the one discovery that would redeem all the fumbling and reveal the order in the chaos. One of the ways children arrest their progress as artists is to rely on conventions that save them the tedium and trouble of finding a fresh way to render what’s there. A bent “L” will make a nose, a line drawn between the legs of a stick figure creates a skirt. In a similar sense, poets—myself included—can fall into what has worked before instead of sorting through the endless possibilities and facing the bottomless contingencies of composition. In contrast, “Poetics” describes a joke—and I think also a poem—as “A disappointment satisfied.” A writer needs considerable tolerance for disappointment to reach satisfaction. It ‘s fiddling with a stubborn key until you find just right pressure, position, and timing to start the engine. Style, Nemerov said, “Is the fire that eats what it illuminates,” and pure style can become pure convention, not a sincere response to the difficulty of writing poetry but an antidote for it. And nothing is more devastating than discovering your own style, the ways you abandoned your standards instead of riding the subject until it’s truly yours. I may have to flap my wings furiously to soar as Nemerov did but still hope to fly. We moderns see the unconscious, but I wonder if we’ll ever accept its influence. Behavior we consider rational actually reflects deep motives, deep associations, deep affections, judgments, and tastes. We can’t say with absolute certainty what invisible instincts compel us, and the social circumstances that create and constrain us also blind us to their sway. “DNA is boss,” a biology colleague once told me. In his view, art, government, learning, and all emblems of civilization spin from one central helix. I don’t like to think so. Instinct scares me. Extreme emotion feels like an alternative existence, and I return from my moments as Dionysius, Macbeth, Caligula, Mr. Hyde, or the Incredible Hulk with strange memories. Perhaps I’m in denial—my intellect accepts that possibility—but when instinct surfaces, I don’t feel like me. I feel aberrant. I can’t abide believing those moments are the true me and rationality is fantasy. The conscious mind writes the autobiography of our species. Unaware of what is going on deep down inside, the conscious mind assigns itself the starring role. It gives itself credit for performing all sorts of tasks it doesn’t really control. These ideas create a lively theoretical debate, but I listen with more than intellectual interest because I have a nasty temper to keep in check and regular appetites I don’t want to indulge. I’m more on Nagel’s side. Will, not instinct, channels desire, and I can’t let go of my control. Feeling and thinking negotiate endlessly in my brain. I mark my success by reason’s record of wins to losses. But at a cost. I see Brooks’ point. I wish I could invite my unconscious in. I have a strange memory for conversations—no matter how many years separate me from them, they continue—and many focus on my muted emotion, my “unavailability.” My college senior self is still leaning on the metal rail of my cousin’s stoop, listening to my friend lecture me about being “too uptight,” and that friend’s voice joins an MFA teacher who blows the steam from her tea and takes a slow, stalling sip before informing me my poetry is too neat to reach any reader’s heart. The conversation between Brooks and Nagel awakens echoes. In his review, Nagel cites the famous EQ experiment where researchers asked four year-olds to forego eating one marshmallow for the future delivery of two. Those who could wait scored better on the SAT in later life and had better college completion rates. Those who couldn’t wait ended up in prison more frequently. The moral of this story seems clear to Nagel and just about everyone else—self-restraint wins. Nonetheless, I envy those immediate marshmallow eaters. They ask questions I’ve hidden. Does the pleasure of an unexpected boon surpass the agony of waiting? Who needs two marshmallows? Curiously, I’m always thinking about the proper place of impulse in my life. My internal pilot directs me that, okay, now I can give someone a hug or that now is the moment it’s I okay to object strongly. Sometimes, after becoming angry at students, I return to what moved me and how much ought to have moved me. The Greeks used the word thumos to describe “spiritedness,” and, though they sought to guide it, they regarded it as essential. Some moments must move us, and I sometimes wish I didn’t need to think about which. This week one of my students asked a familiar but welcome question. She wondered aloud whether primitive humans might have been happier than we are, whether modern improvements complicate life instead of making it easier, whether our desperate desires have led us to confusion instead of comfort. I wonder if I could believe the answer if I found it. 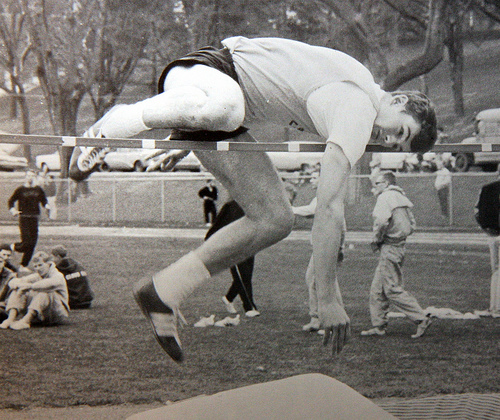 When I think of my brief career as an eighth grade high jumper, I recall tumbling into the bar over and over as if I were turning in a particularly bad dream. I pulled the bar from beneath me or behind me or on top of me and set it back on the standards again for another try in an infinite series of futile attempts at the qualifying height. Following each “sproing” of the aluminum bar, a sound echoed from 50 yards away, where Coach Tristin stood timing runners. After each away track meet during my eighth grade season, the team sat on the bus as Coach Tristin handed out ribbons. By the third or fourth track meet, it became quite clear I was unlikely to win any ribbon in high jump. Coach Tristin patiently tried to teach me in practice, but somehow the moves never came naturally. The bar kept falling. I seldom cleared the qualifying height and never scored a point for the team. Late in the season, Coach Tristin began to throw me into some longer races—and eventually that is where I found my niche in track—but, without much training or preparation, I was no more successful at those races. On the bus after the last meet, I remember the same names being called and watching teammates swinging on the seat backs, their legs kicking up to the front of the bus. Some seemed embarrassed and some boastful, but they all turned around smiling. My throat balled into a fist. I so wanted those ribbons… which Coach Tristin could not give me, which no one can give anyone. At the end of eighth grade, I went to hand over the uniform my mother had reverently washed and folded. Coach Tristin checked me off. I hadn’t intended to say anything, but what came out was, “I don’t think I’ll be doing track next year.” I suppose I hoped he’d say I hadn’t found my event or recall a moment of promise or offer up some praise for my effort, but Coach Tristin just looked tired. I said, “I didn’t contribute,” using the word he’d stressed all season. Of course, I don’t remember his response exactly. The gist was, “Come out or don’t come out, it’s up to you.” It was the lesson he thought I needed. If he said, “Yes, leave,” or “No, stay,” he could have made it easier, but it’s never easy. Or clear. My supervisors and some of the people I supervised praised my work ethic, but no one objected strenuously to my stepping down. I took that as a sign. Coach Tristin was not a pretty man and is an even uglier ghost. He stood before me. When you quit, some people always say you’re courageous, being realistic because you recognize what you really want to do. But it sounds like faint praise. “You’re smart to cut your losses,” they seem to mean, or “embracing your limitations is noble. It’s self-knowledge.” Yet, for me, it never seems so. My history of quitting is no longer or shorter than anyone else’s. I’ve quit because of fatigue, disinterest, and frustration. I’ve quit to pursue new opportunities or to liberate time. I’ve quit prematurely and well after I should have. Every time I ask what the decision makes me. I can’t split the act from the actor. Few people who knew me as a supervisor remain, and others have dim memories. Occasionally someone will mention it, however, and then my oversensitive soul hears a whispered “mistake,” or “quitter,” or “failure.” They assume we both see that chapter of my life the same way, but the person who leapt toward that high jump standard over and over and over—hates those moments. I never high jumped again and didn’t come out for the next track season. Later I did come out, and when I ran for another coach and several after that, I discovered I was a talented runner. I contributed, won ribbons. At first, I ran to defy Coach Tristin, vanquish the specter of surrender, paste over a picture of myself I couldn’t erase, but then I ran to stop worrying I’d quit track or anything else on anything other than my own terms. Some part of me is still the boy sulking over ribbons he thinks he deserves, the one who wants to show the world he can. Look into my eyes and you’ll find the phantom of Coach Tristin and the fear the rest of the world will see him there too. My first year of teaching, a student I’ll call Emma was in my sixth grade language arts class. She must be in her early 40s now, I haven’t seen or talked to her in over twenty years, yet lately I’ve been thinking about her. 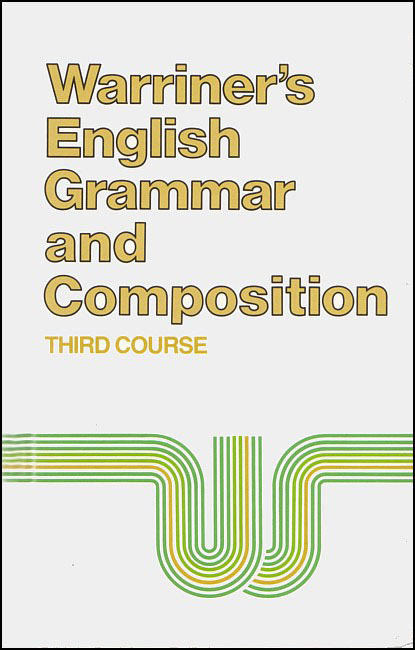 Emma was the quiet child who patiently watched classmates flail at question seventeen of last night’s homework in Warriner’s English Grammar and Composition then, assured no solution would arrive, calmly offered the correct response. Random homework checks or pop quizzes never caught Emma unprepared. She frowned when I fumbled over coming up with example sentences for subordinating conjunctions. Emma set every curve. Knowing what I know now, I should have challenged her more. Not with the work—there was no doing that—but with reminders she didn’t need to be so demure or deferential. A first year teacher isn’t going to ask a student to challenge him, but that is what I needed to do. I worried I couldn’t teach her because she was smarter than I was. Emma had a fierceness I should have called out more. The last of the emperors and their attendants must have seen their days grow short. Everyone who recognizes talent developing recognizes Ernie has a special capacity to dazzle on the dance floor. So frequently did I drive from Cranston to Crilton that seldom did I look beyond the hood ornament. I remember writing a sentence on a napkin in a bar some dissolute Thursday night with my equally young and equally strained colleagues howling at my bringing work to play. I didn’t want to let Emma down. I pictured her waiting. I imagined how disappointed she’d be if that spot on the bulletin board were empty. By the end of the year, I might have posted the first sentence of The Declaration of Independence and expected the diagram on Monday morning. Teaching is my passion. I like my students. I’m lucky to have found something that, most days, I can do, even luckier to have found a demanding task I like to do, that some days I’d do for free. Nonetheless, I have hours of despair and anguish. I prefer to believe my students need me, but I often doubt it. Though some students enjoy challenges, many set the standard at completing the work, getting good grades, and moving on. I swing like Tarzan between the Emmas I encounter. I’m proud when I can train someone who shows little interest in schooling, but I love students who return my investment ten-fold. They keep me going. Whatever their abilities, they want to “take me on” in every sense of that expression. They are like Emma, ready and seeking. I own one book I’d truly grieve losing, D’Après Tout by Jean Follain. My reasons are partly sentimental—I went to great trouble to get the book, and it found me when I felt lost in my writing life. Most of all though, the poems inside are ones I wish I’d written. Calling them miniatures, however, belies their echoing expansiveness. They are miniature in the sense that Sherwood Anderson’s stories in Winesburg, Ohio are incomplete or in the sense that James Joyce’s stories in Dubliners are inconclusive. They are whole, just not in a way readers immediately and consciously recognize. Little details subsume so much. To describe Follain, McHugh evokes what William Gass said of Faulkner, “Nothing was too mean for his imagination because he did not believe there was any insignificance on earth.” Follain turns a reader’s attention to the rites of life. Minute ceremonies become tuning forks for the wider world. The deliberately murky punctuation of Follain’s poetry can make them seem lists or collections—the clouds, the grass fire, the flowers in the ravines, the dying daylight, the boy and his “iron-gray smock,” the shoe. What seem separate, however, are truly tangled. The smoke is like the clouds, the rut in the road repeats the ravine, the color of the sweater matches the color of the clouds or smoke, the mass of clouds breaks up and dwindles to one boy on one road, the meditation on “half-heartedness,” and “absence” comes in half light, the flowers in the ravine foreshadow the boy’s vivid life amid others’ half-heartedness and absence. The poem becomes complete, at least in its own fashion, by creating a subconscious continuity, a homogenous atmosphere. The boy is a part of things in ways we might not readily recognize…but know nonetheless. At the same time, in the presence of all that is mixed—the smoky air, the flowers and the ravine, the rutted road—the boy innocently tying his shoe is the one pure, undiluted thing. An act we’ve seen and done countless times becomes a holy note in a cathedral-sized setting. Never coercing a reader or revealing himself too visibly, Follain says what can only be said indirectly. Follain often links the immediate and the eternal, the individual and the universal, the enunciation and the prayer. In “Looks,” he describes a sick man studying “the reflection / of a tiny landscape” in a drop of water, and in “Man Alone,” he ends with a figure “representing by himself / without wishing to betray it / all of humanity.” Follain said he sought to recover the “naked beauty” of things, but it seems that beauty is a commonplace, a part of everything he notices. The last poem in the collection, “That’s Life,” focuses on the “fresh laughter” of old women, “their bodies which were once beautiful / keep pumping blood and endure.” All that people were is present in what they are. To a casual reader, little in D’Après Tout may seem more than raw observation—and disjointed observation at that. A cursory reader might regard his poems as pleasant but insubstantial. Reading his work carefully and rereading it, the collective effect changes. These miniatures may seem mundane, but the elegance of the writing lifts them…to revelation.